Southeast Asia is expected to become the world’s 4th largest economy by 2030 with projected growth rates of 5.2% between 2018 and 2022. As urbanisation and industrialisation in ASEAN increases, the region’s energy demand is also expected to grow by more than 67% by 2040, according to the International Energy Agency (IEA), where almost 80% is supplied by fossil fuels. Of which, electricity demand in ASEAN is forecasted to grow by 250%, In 2016, the IEA estimated that around $2.5 trillion of investment is needed to supply ASEAN’s forecasted energy demand between then and 2040. The power sector takes up approximately half of the amount, while the remaining is split between fuel supply and energy efficiency. The growing demand for electricity thus calls for the development of power generation and transmission infrastructure. However, given the region’s inability to meet domestic demand with its production capacity, the rising dependence on imported energy raises energy security concerns. Coordinated regulatory efforts towards flexible and transparent markets, enhanced interconnection of natural gas supply networks will help in mitigating concerns. Expanding electricity access is prioritised in Southeast Asia, as evident in its increase in electrification rate by 28% to 90%, since 2000. 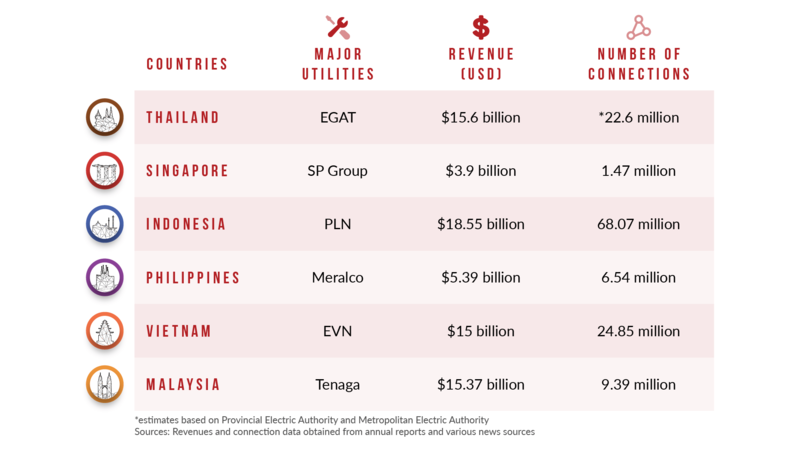 Advanced metering infrastructure (AMI) like smart grids and meters are sought after as the next phase of digital transformation for utilities, supported by regional organizations such as the Heads of ASEAN Power Utilities/Authorities (HAPUA) who urged the development of an ASEAN Smart Grid Roadmap. Major utilities in ASEAN are expanding their digital adoption initiatives to cope with increased competition from startups and cater to changing consumer habits. Smart meters and grid implementation are the main focus for all electric utilities as the need for energy efficiency rises. Tenaga Nasional Bhd, the sole power utility in Peninsular Malaysia, has started deploying smart meters with an aim of 1.54 million smart meters throughout the Melaka and Klang Valley region by 2020. At the same time, The Manila Electric Company (Meralco), largest power distributor in the Philippines, aims to deploy 3.3 million smart meters by 2024 and has a smart grid roadmap to 2027. Smart meters provide large-scale players an edge by providing vital data needed to decide the next phase of development for digital transformation. Another area of interest is the rise of peer-to-peer energy trading platforms. The increasing accessibility and affordability of simple power generators like solar panels and windmills has led to the creation of microgrids in communities which provides cheaper and more stable power. Utilities are capitalizing on these opportunities with trials of microgrids in small communities and developing digital platforms using blockchain to facilitate sale and purchase of energy between neighbours with excess production and consumption. BCPG in Thailand has rolled out a solar powered microgrid in Bangkok and partnered UK energy tech firm, Power Ledger, to utilise blockchain-powered platforms to facilitate peer-to-peer energy trading. The thai firm aims to establish 20 more similar projects over the next few years to test the solution’s sustainability. In line with the region’s focus on collaboration, electric utilities are engaging partners both regionally and globally to develop and adopt suitable solutions for their operations. The Provincial Electricity Authority (PEA) of Thailand has launched an innovation center with chinese tech giant, Huawei, to improve its smart grid systems. In the Philippines, Meralco is in discussion to test various concepts with global partners, such as Verv from the United Kingdom, a firm specialising in using blockchain for energy trading and Nuvve from America that utilises blockchain to power electric vehicle charging stations. In Indonesia, Perusahaan Listrik Negara (PLN), has engaged local telecom giant Telkomsel to to launch a narrowband IoT (NB-IoT) network for smart meter systems. PLN, the state-owned power utility, stated that the project is the first commercialized implementation of the technology in ASEAN and would serve to develop the AMI in the country. The energy sector of ASEAN is prime for growth with surging demands from both consumers and corporates. Given a regional focus on sustainable developments, electrical utilities are looking at renewable and alternative sources of energy such as community solar power plants as well as energy efficiency. Utilities tap on the private sector’s digital expertise such as telcos for specialised networks as well as supporting digital infrastructure. As digital transformation progresses, data will prove to be the next turning point for utilities as they glean insights over time to decide their next phase of developments.